No matter what you call them; zucchini fries or zucchini sticks these are out of the garden, baked and so good! Place 2 cookie racks inside 2 separate baking sheets and lightly brush or spray with extra virgin olive or canola oil to coat. In a medium bowl combine the flour and 1/2 teaspoon sea salt. In another medium bowl beat the eggs. In a medium/large bowl combine the cheese, bread crumbs and spices. Cut the zucchini into roughly 3″ lengths and then into 1/4-1/3″ sticks. Coat a handful of the zucchini sticks in the flour mixture (I usually just toss with my fingers) then coat in the beaten egg (I use a fork to flip and rotate around) and finally toss in the cheese and bread crumb mixture (I use a fork to flip and rotate around). Place the zucchini sticks on the prepared cookie racks making sure they are not touching. Continue this process until the racks in the pans are full. When the second pan is half full, preheat the oven to 450. Bake the zucchini sticks for 15-20 minutes, until they are golden brown. I served the sticks with ketchup and an avocado cut inside the skin and filled with salmon salad. This entry was posted in in the kitchen and tagged appetizer, baked, bread crumbs, fries, gluten free, recipe, snack, sticks, vegetarian, zucchini on August 6, 2016 by lenapietri. Shred zucchini, place in a mesh sieve, sprinkle with salt and place in a larger bowl or over the sink and allow the water from the zucchini to drain for 30 minutes. Meanwhile prepare the carrot, celery, onion, and garlic. Place in a large bowl with the herbs and lemon juice and mix well. In a separate bowl combine the chickpea flour, baking powder, black pepper and optional cayenne. Prepare the rest of the meal (I recommend your favorite grain, salad and sauce). I served them on a chop salad straight out of the garden with ranched sour cream (recipe below). While the pan is preheating- squeeze out excess water from the zucchini by firmly pressing the zucchini between your hands and let the water drain out. Place the squeezed zucchini in the center of a kitchen towel, wrap and wring out remaining water by holding the ends of the towel and twisting. Add drained zucchini to the prepared vegetables and herbs. Add the egg and mix well. Add the dry ingredients, combining well. 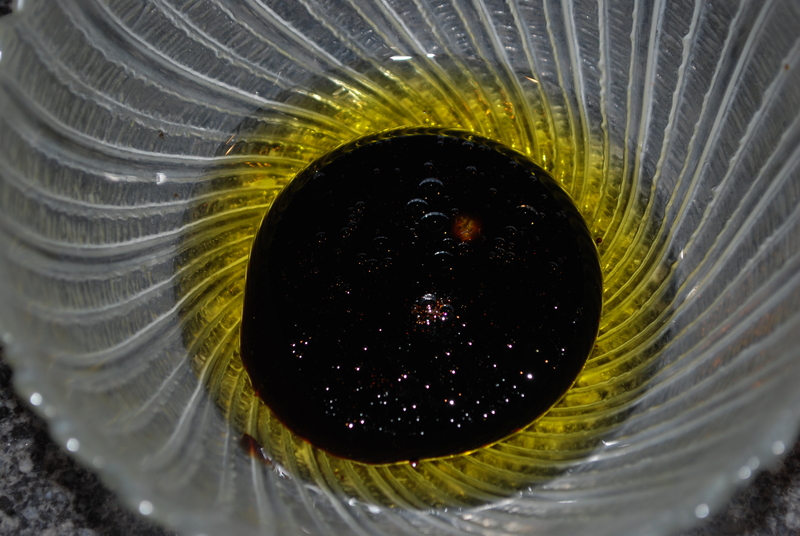 Oil the pan to coat and allow the oil to heat but not smoke/burn. Scoop 1/3 cup of “batter”, dollop onto the hot oiled pan and press down slightly. Add more patties but don’t crowd them so they are easy to flip. Fry each patty for 3-5 minutes, until they are golden and begin to brown on the edges, flip and repeat on the second side. Remove from the pan and drain on paper towels in a single layer. **They can be kept warm in a 200 degree oven or simply serve right out of the pan. Combine all ingredients and chill till ready to serve. 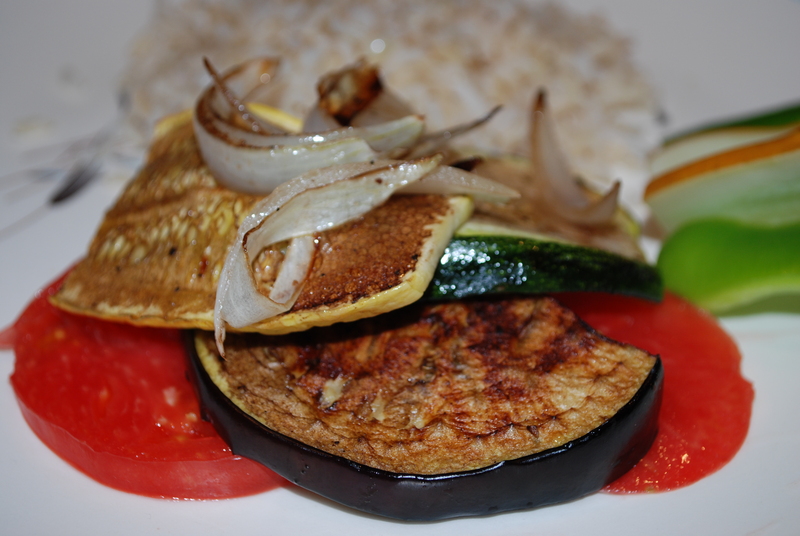 This entry was posted in in the kitchen and tagged burgers, cakes, creamy, dressing, fresh herbs, fritters, gluten free, patties, ranch, recipe, style, vegetarian, zucchini on August 18, 2015 by lenapietri. 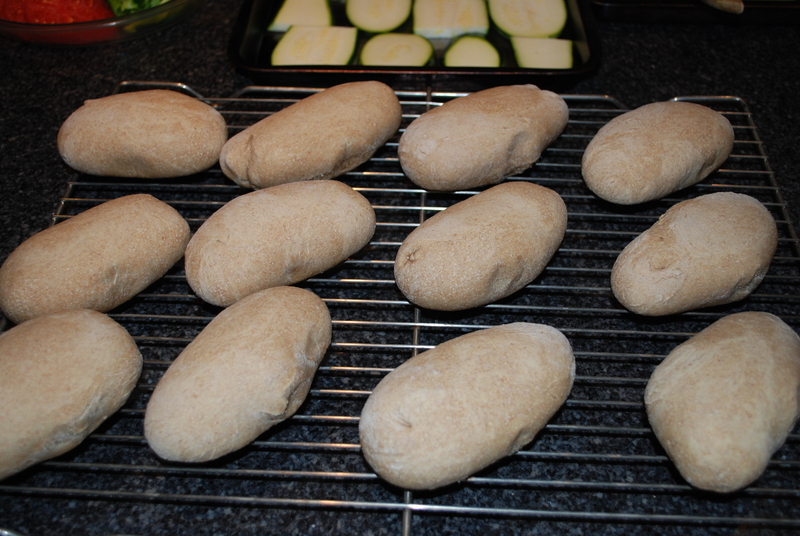 I started the day by baking rolls knowing that I was picking vegetables to stuff them for dinner. 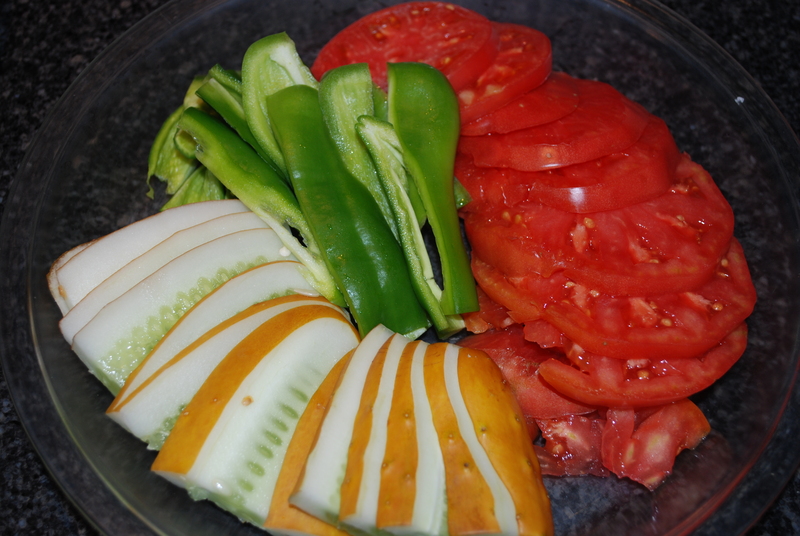 Preparing whatever comes out of the garden is wonderful; fresh and rewarding. Featured on this sandwich are zucchini, tomatoes and amaranth greens out of the garden with onions and homemade ranch dip/spread. Process all ingredients in a food processor or use an emersion blender until creamy and refrigerate until ready to serve. Wash all vegetables and prep by slicing to fit a sandwich. 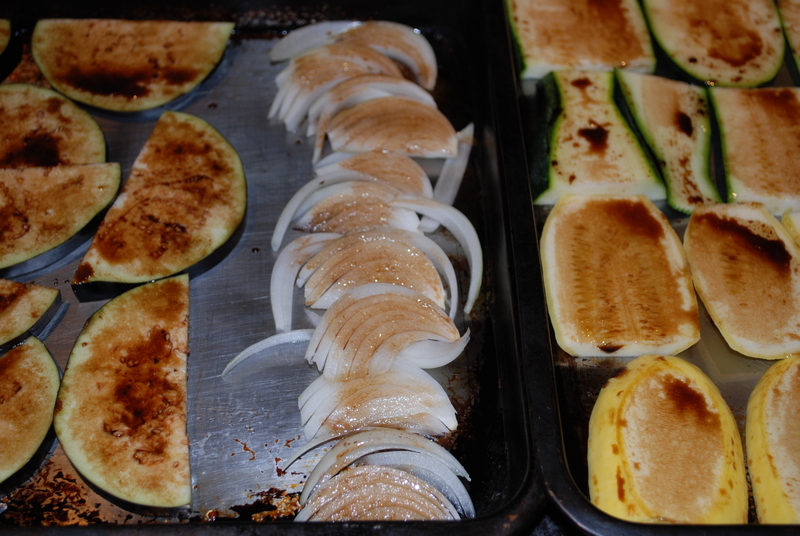 Preheat a large skillet over medium high heat, coat with extra virgin olive oil and fry the zucchini on both sides until it becomes golden with some brown areas. I arrange all of the vegetables on a platter so each person can make their own stack on a roll (or for a gluten free option, the large amaranth leaves used as a wrap is perfect). This entry was posted in in the kitchen and tagged aioli, amaranth, avocado, bean, dip, free, fresh, garden, gluten, gluten free option, greens, marinated, onion, option, purple, ranch, recipe, salad, snap, snap bean, string, tomato, vegan, vegetarian, zucchini on August 6, 2014 by lenapietri. Some of the snap peas got away from me and are now becoming the seeds for next year. I am leaving them on the vine until they are fully ripe and dry then collecting them and setting aside. 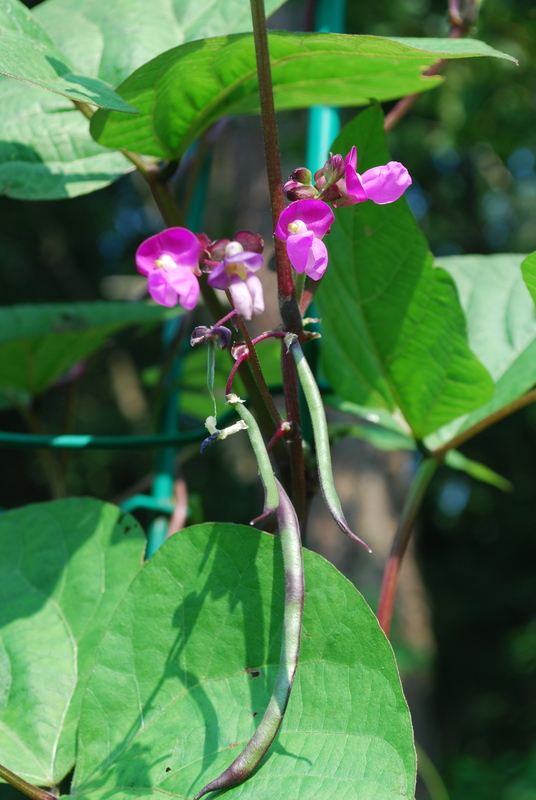 I planted purple pole beans this year as a trial. I must say they are beautiful but the true worth will be known once they are ready to eat. The yellow wax beans were a great success last year prepared fresh and pickled so in they went again. The first harvest was more than I expected. They are washed and in the refrigerator so I can pickle tomorrow. The zucchini is late this year but they grow so quickly that this first little one will be ready by the end of the week and there are plenty of blossoms too. The Italian peppers are coming along nicely, here is the first one that may be picked green if I get impatient. These beauties are golden when ripe. 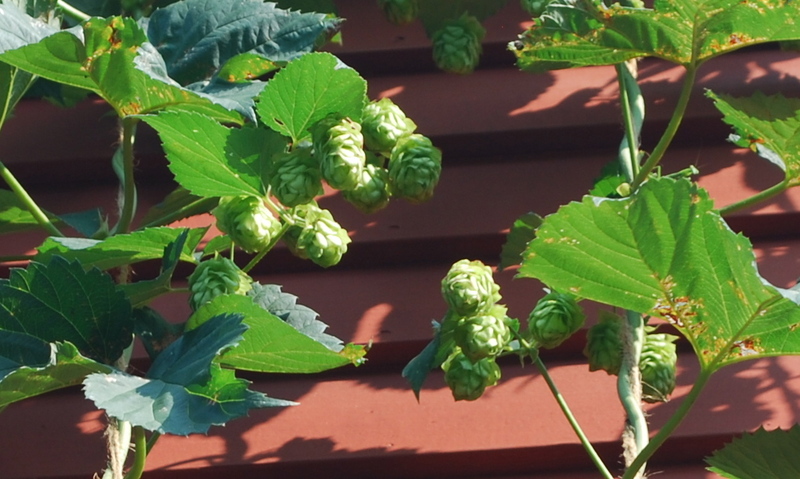 The hops are looking good but I need an expert. I am going to contact our local microbrewery, Relic Brewery, and offer the hops to them. 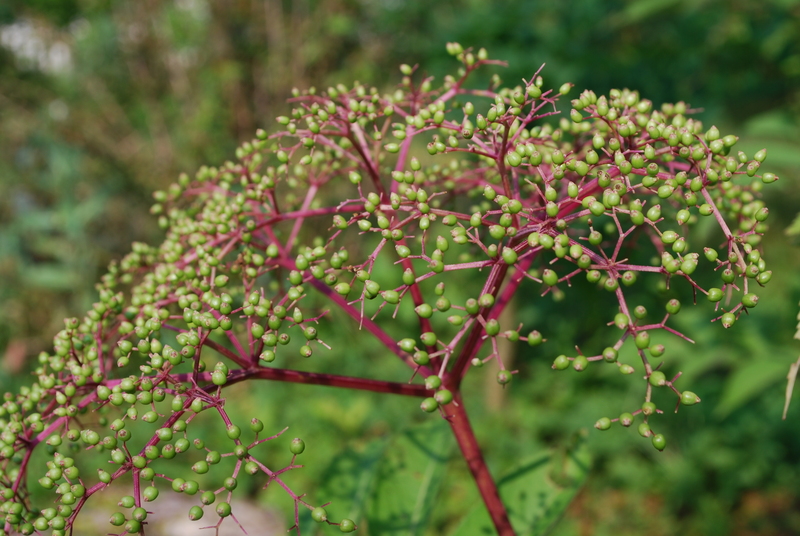 The Elderberry bush-tree is both in bloom and forming berries. This entry was posted in in the garden and tagged beans, connecticut, ct, edible, elderberry, elderflower, garden, going, hops, Italian, natural, peas, pepper, plainville, purple, seed, snap, to, wax, yellow, zucchini on July 23, 2014 by lenapietri. Preheat the oven to 400. 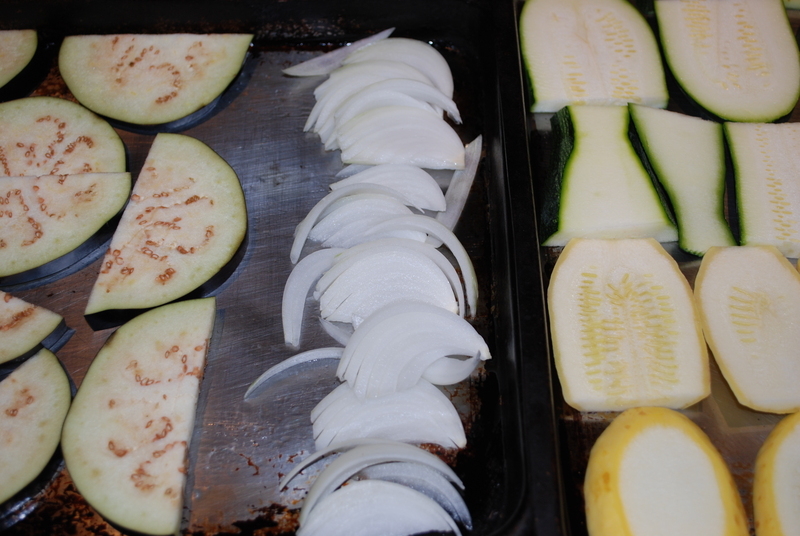 Oil baking sheet(s) by using a brush to evenly spread on extra virgin olive oil. 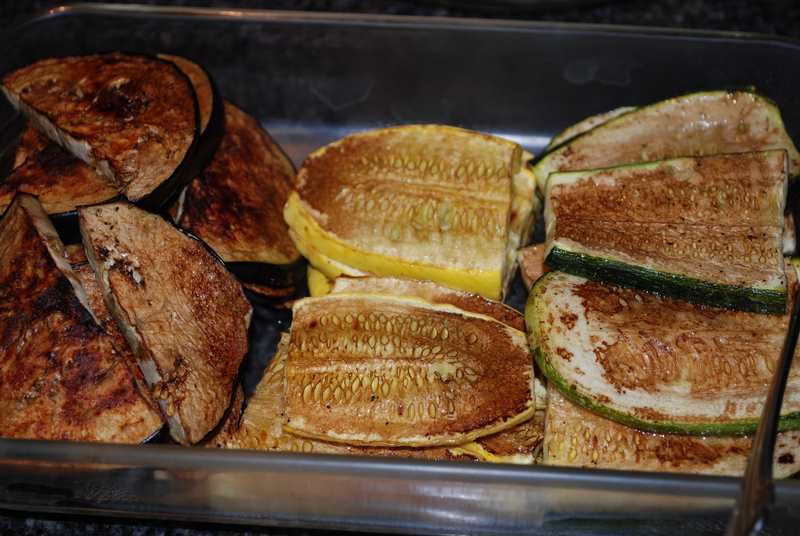 Place vegetables cut to 1/4 inch thickness (I used zucchini, yellow summer squash, eggplant, and onion from our garden and a local farm) in a single layer on the baking sheet. 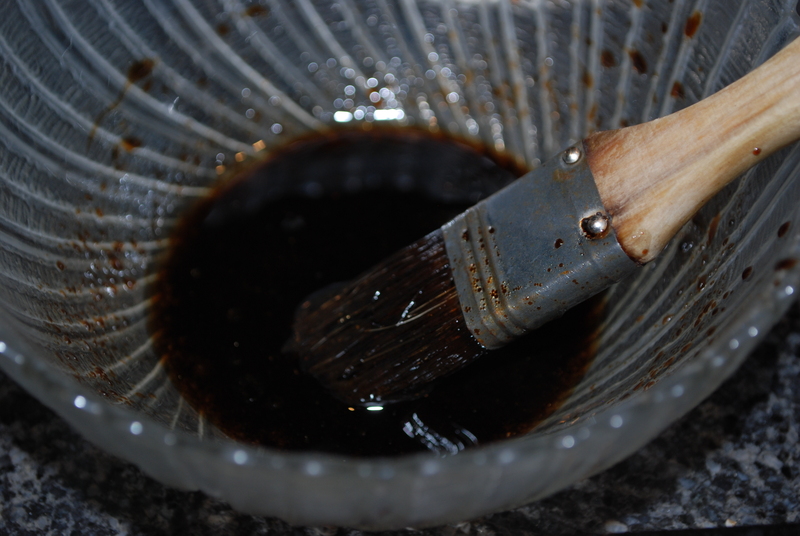 Mix 50/50 extra virgin olive oil and balsamic vinegar and brush onto the vegetables. Sprinkle with sea salt and freshly ground black pepper. Turn off the oven and turn on the broiler. Place baking sheets with prepared vegetables under broiler for about 10 minutes (check to be sure there is no over cooking). I served these easy vegetables on homemade mini rolls as vegetable sandwiches (with tomatoes, peppers and cucumbers from our garden and a local farm) with cheese and homemade mayonnaise as an option. Gluten free? Torie had schar brand gluten free bread and I had a side of brown rice with the vegetables. They sure know how to make a Mom feel good! 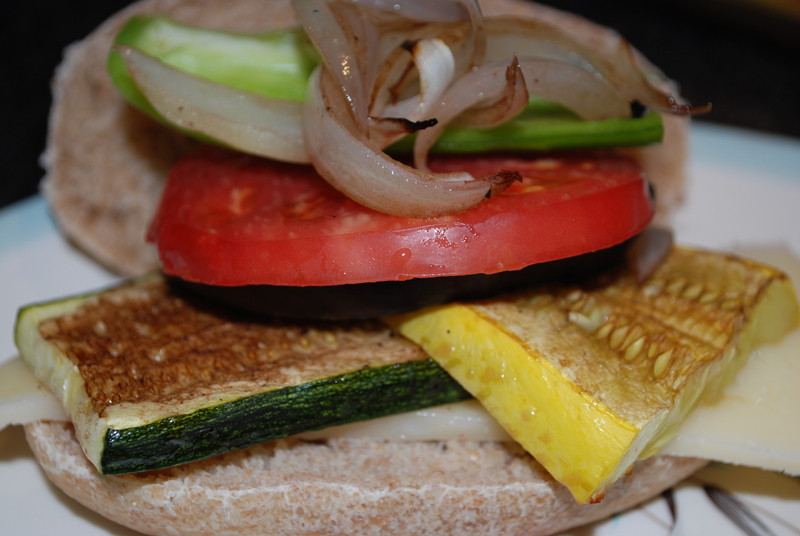 This entry was posted in in the garden, in the kitchen and tagged balsamic, eggplant, gluten free option, homemade, mini rolls, roasted, sandwich, summer squash, vegetable, zucchini on August 26, 2013 by lenapietri.